While much wildlife in Kenya has a good life, a number of animals are threatened their existence. This page lists some of the most important ones. Two of the most important threats to wildlife in Kenya are loss of habitat due to the spreading farms and cities, and poaching for their exotic pelts or horns. Often a symbol for all wildlife in Kenya, the African lion is ranked as vulnerable. They once had a very wide-spread range through all of Africa, southwest Asia and even into Europe. Today the largest populations of lions are in Chat, Sudan, Tanzania and Angola. In Kenya, lions are found in the Great Rift Valley regions, and along the southern border of the country. Parks like the Masai Mara National Reserve have sizable populations of lions. There are estimated to be around 2,000 lions left in Kenya. 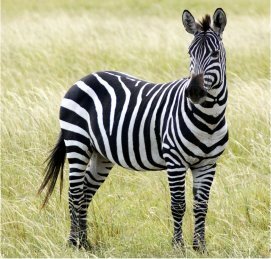 This species of zebra is found exclusively in Kenya and Ethiopia, and is ranked as endangered. The total global population of Grevy's zebra's is around 2,000, with only 750 breeding age individuals. They are found in the central part of Kenya, with a few smaller populations found towards the north, near Lake Turkana. However, some observations have suggested that their numbers are actually increasing in Kenya. A close relation to the Grevy's zebra is the Plains zebra, which is not threatened and has a population of approximately 200,000 in the Masai Mara and Serengeti areas. The black rhinoceros (which is not actually black), is one of the most threatened animals in Kenya. They are classed as critically endangered by the IUCN. It's estimated that there are around 4,000 black rhinos left in the world. The species levels are considered critical because the numbers have been dropping so rapidly. The white rhino is also very rare in Kenya, with only a few dozen individuals. But their overall population is in much better shape, living primarily in South Africa. Though extensive research and protection, the African elephant is now listed as near threatened. It has ranked at endangered in the mid 1990s. 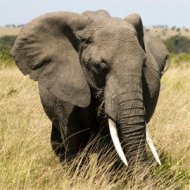 Elephants can be found in Kenya in the central part of the country, as well as in the south-west regions. The Shimba Hills National Reserve is particularly well-known for it's large elephant population. The world-wide crackdown on illegal ivory has helped the African elephant recover as a species. Cheetahs live in central, and south-western Kenya, but have larger ranged through Botswana and Niger. In Kenya, there are approximately 700 cheetahs, with a world population around 7,000. Like many other large cats, they are often hunted by farmers who are trying to protect their cattle from predators. This is a common problem for much of the wildlife in Kenya.